Atlantic Shopping / Inspiration-and-advice / What Are Gas Lift Bar Stools? Mentioned on our website is the term "gas lift" that you may have encountered several times. Some people enquire as to what this actually means. Our gas lift bar stools have variable height mechanisms; the seat can be elevated or dropped to a height anywhere between the highest and lowest reach of the column. For example, they can be altered to fit below any surface and raised for children or the smaller individual. It consists of a hydraulic cylinder that makes up the main stem of the stool and a part of it is often sheathed by the footrest. 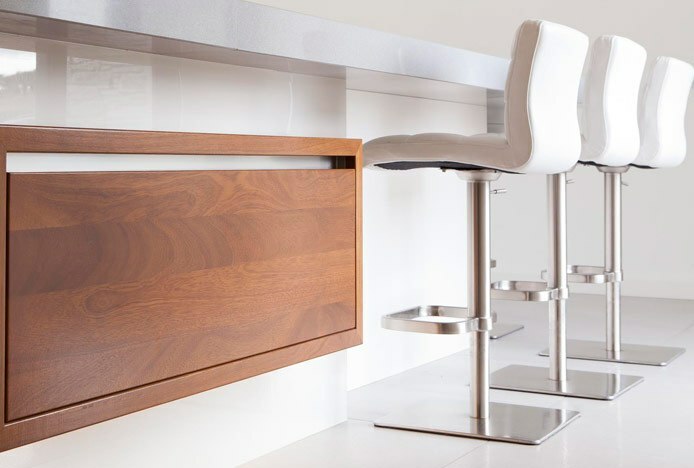 "Boasting unbeatable practicality, most bar stools on the market are adjustable in height. More versatile than fixed models, they can be used at a variety of surface heights due to the addition of a gas lift. With a vast spectrum of styles and designs available, there’s something to suit all tastes." Similar to the apparatus commonly found in office chairs, but bigger, adjustable models contain a gas lift mechanism. As illustrated in the photograph below, it consists of a hydraulic column made up of an inner cylinder and larger outer cylinder that can extend and contract with impressive fluidity. During assembly, the wider part of the column is inserted into the hole in the base, held together by a compression joint. The narrower section fits inside the footrest section of the stem, with the top button exposed to allow for height adjustment. To adjust the stool, the button is pressed down by the activation lever found beneath the seat, opening a valve that allows the air to flow in and out. When someone sits on the stool, the air is forced out by the weight acting on the seat and the cylinder contracts, lowering the height. And, designed to refill with air, it never needs topping up. Vice versa, when there is no weight on the stool and the button is pressed, the cylinders fill with air, expand and thus raise the seat. When not being pressed, the gas lift locks in place at whatever height it has been set to for increased stability. The vast majority of adjustable models sit on single column metallic frames in mirrored chrome or brushed steel, making them great slimline minimalist pieces, as seen in the Oracle. Nevertheless you occasionally get an exceptional design like the Summit, which has a four-legged base for added stability as well as a striking look. Whilst the activation levers can be metal, plastic or both, this is purely looks based and makes no difference to the seat’s efficiency. In the diagram below, image 1 shows the activation button in relation to the lever that is attached to the top of the column. You can also see the seat plate where the underside of the stool will be attached. Image 2 depicts the lever as it begins to be manually pulled upwards, causing it to pivot towards the button. Finally, in image 3, the lever engages with the button, activating the mechanism. This causes the seat to either raise or lower, depending on whether someone is sat on the stool. When there is no weight exerted on the seat and the lever is pulled, the column will rise. Or, when somebody is sat on the stool, the seat will lower. When the lever is not pulled, the button will not be activated, and the height of the column will stay the same. With so much differentiation in surface height, both commercial and domestic customers value adjustable models as they offer a safe option. 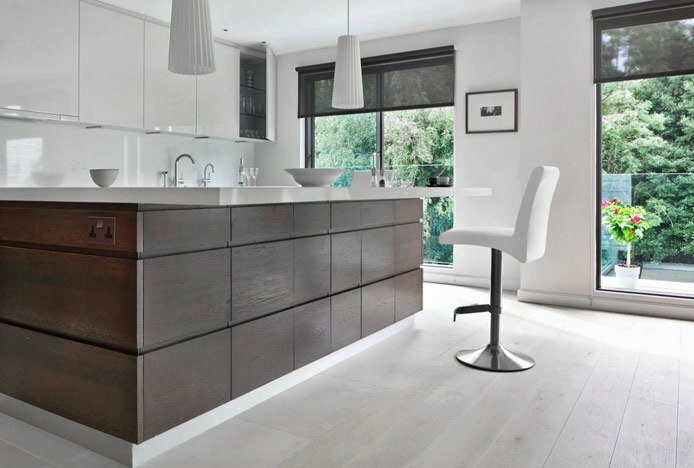 Whilst normal kitchen worktops and islands measure approximately 90cm, commercial bars can reach up to 110cm. 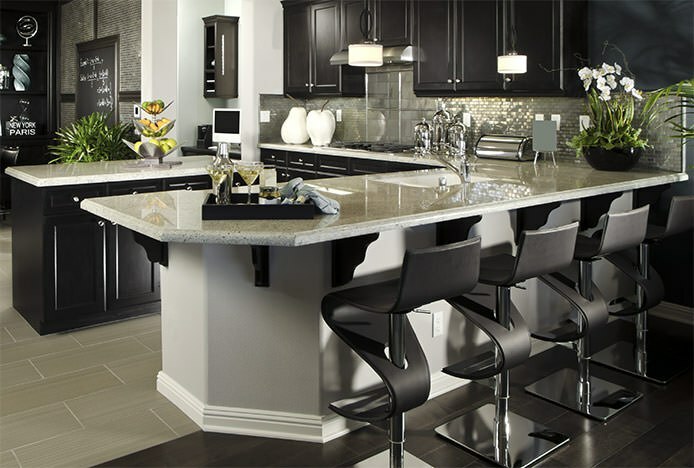 Increasing numbers of breakfast bars are being built with elevated surfaces, and many kitchen counters are now custom made to varying levels. But with easy adjustability at your fingertips, you won’t need to fret over measurements or worry that your stool will be too high or too low. In the home, they can be tailored to the requirements of family, friends or guests, as well as specific locations. Likewise in commercial establishments they can be altered to each customer or client, making them feel prioritised and catered for. Furthermore they’re ideal for those shorter in height, including children, along with taller users, as the seat can be raised or lowered accordingly ensuring a comfortable position. Characteristically multi-purpose, they can be used at numerous surfaces around the home. With dining seat height at approximately 45-50cm, many of our low bar stools work brilliantly as additional seating around the table, ideal for special occasions with large families or unexpected guests. However you do need to bear in mind that the footrest, whilst delivering much needed support, will limit how much it can be lowered. Nonetheless, models like the ever-popular Profile employ an incorporated footrest that won’t impact the base in the same way, and thus can descend as low as 52cm for optimum versatility. "Not only can they be tailored for use around the table, but lower models are also great for compact storage. Simply tuck them below the counter when not in use, ensuring they’re out of the way. This decreased level also makes them easy to transport, taking up less space than fixed height designs." If that’s not enough, these fabulous models also include 360 degree swivel capabilities, enabling easy access to bar counters, and movement of the seat without having to move the stool itself. Yet whilst this is beneficial in the vast majority of situations, if they’re going to be used by boisterous children who like to spin around and constantly play with the gas lift, you may find that you wish to remove these functions. The adjustable height can be easily prevented; simply detach the lever after setting it to the desired elevation. We often have customers ask if it is possible to permanently lock the gas lift, so for more drastic measures you can use a small amount of clear bathroom silicon between the column and the footrest section. This will permanently remove both swivel and height maneuverability. We’re committed to making great products that are both functional and stylish. Whether you’re looking for a versatile gas lift model or a sturdy fixed-height design, we’ve got the stool to suit you. To get started, click the button below to view all bar stools. Find out how our hobby craft stools could help to make your life easier..